Deeplocal — a creative conglomerate of engineers, designers, and marketers — partnered with the Google Assistant marketing team to create a unique Poster Maker robot for last year’s Google I/O developer conference. The robot was built using the Google Assistant SDK for devices, which lets you embed the interactive assistant into projects, allowing you to control it using voice commands. The Poster Maker Robot looks and acts just like a CNC plotter, which for all intents and purposes it is, as it features all the hardware needed — including v-wheels, pulleys (idlers, GT2s, etc. ), slides, and several motors to control the X and Y-axis. At the end of the plotting arm is a 3D-printed marker changer (pen turret) that holds five different colored pens, and capable of switching out colors on the fly while creating a custom poster. A Keyestudio CNC board along with a Raspberry Pi runs the Google Assistant SDK for devices and plotter controls, which are housed inside of a machined-aluminum case with a Corian drawing surface mounted on top. Tasking the Assistant SDK enabled Deeplocal to develop a conversational interface by using the platform’s Actions on Google and Custom Device Actions applications, which allowed them to define device-specific query patterns, intents, and responses. Since Google Assistant is already installed and continuously monitoring for queries, the Poster Maker robot is capable of answering questions during the sketching process. The robot is entirely open source, and Deeplocal has uploaded all the files, code, and even a bill of materials on their GitHub page for those looking to assemble their own. 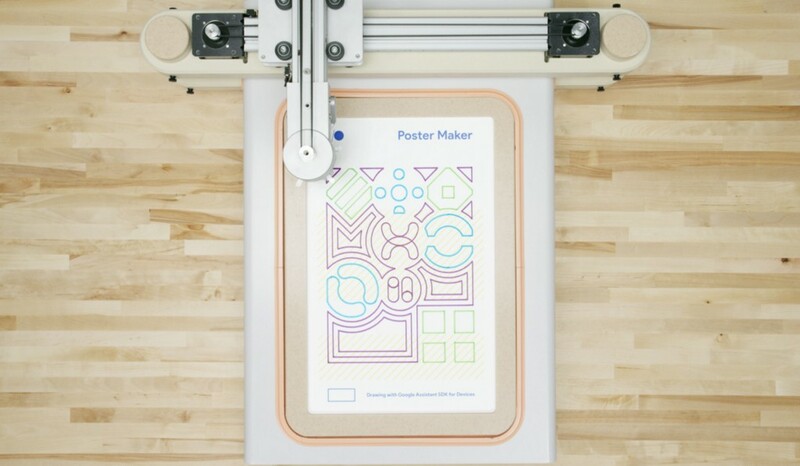 Deeplocal Designs Poster Maker Robot Using Google Assistant SDK and Raspberry Pi was originally published in Hackster Blog on Medium, where people are continuing the conversation by highlighting and responding to this story.